Saturday marked another wowza LSB event, with our star-studded panel presenting some great information on the “buy side” of the market. Dean DuMonthier ’88 gave a riveting characterization of the oil market, and seemed very bullish indeed. Interestingly, the discussion centered around a $125 price for oil, whereas there seems to be a leak in the bottom of the barrel with prices falling back to $100 this past week. One of the key areas of interest is the ratio of oil to natural gas prices relative to the British Thermal Unit (BTU) equivalent of about 8. That is, where the price of oil has about eight times the energy content of a unit of natural gas, and therefore the price of oil should trade at around eight times the price of natural gas (I’ve also seen this ratio at 6). Why is that? Because oil and natural gas are imperfect substitutes, there is money on the table on both the supply and demand side if there is an imbalance. With natural gas prices just under $5 and oil prices north of $100, that ratio is better than 20 rather than 8. So, the question is, is that an anomaly that market forces will correct — that is, with rising natural gas prices and/or falling oil prices? Or, is this a paradigm shift? I sat in a group with Guy Scott ’88, and he gave us compelling cases on both sides (despite what Timothy Siegel at Forbes seems to think). For another complementary perspective, check out James Hamilton’s discussion at Econbrowser. Now, for those of you who are Discovering Kirzner, you might ask yourselves, which is more important to these guys — the price theory fundamentals, or some element of “discovery” and arbitrage? For those of you not Discovering Kirzner, I hope the panel impressed upon you the ubiquity of a relatively straightforward applications of competitive markets a la Landsburg Chapter 7. If any of the panelists happen to be reading this, thanks for coming. It is really great to have you back on campus. And it is great to see you bring your professionalism to our co-cirricular events. We hope to see you again soon. Be sure to get over to the Warch Campus Center Cinema today at 5:30 p.m to see distinguished alumnus Tony Valukas (Class of 1965) talk about his career and the Lehman Brothers collapse. Mr. Valukas is a hot commodity right now, and just yesterday the Legal Times points to continued congressional interest in Mr. Valukas’s services. For those of you grousing about looking for the whens and wheres of the Lawrence Scholars in Business Entertainment Summit, you’ve come to the right place. 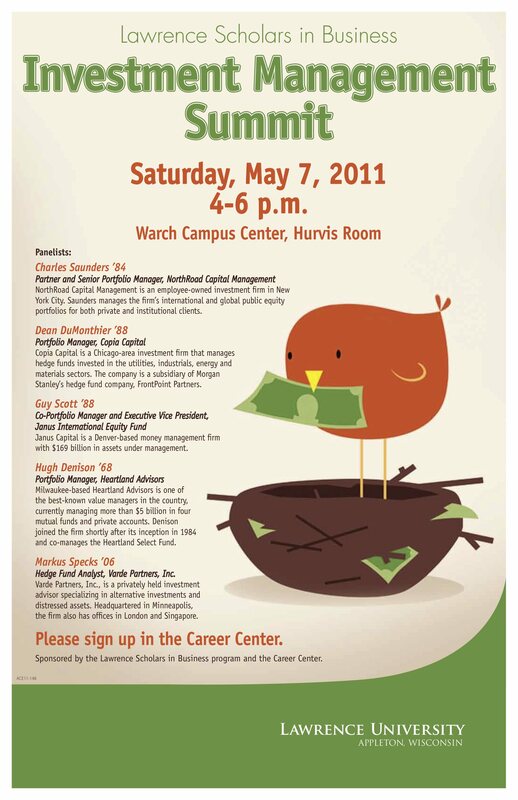 It is today at 4 p.m. in the Hurvis Room of the Warch Campus Center. Dinner to follow at 6, space permitting. This is the final LSB event of the year, and should appeal to folks of all stripes, from the economics majors to the Conservatory and Arts students. Click the poster for the full report. 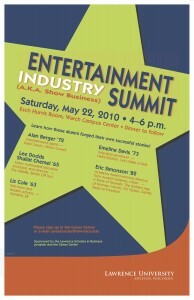 This Saturday the Lawrence Scholars in Business program will have its final event of the year: the Entertainment Summit. This event should be of interest not only to economics and other majors who are interested in the business of show-biz, but also to Conservatory and Arts students interested in getting into the entertainment world. Five Lawrentians who know that world very well will be here to tell us about it: Alan Berger, Emeline Davis, Lee Shallat Chemel, Liz Cole, and Campbell Scott. Take a moment to click on those links, and marvel at the star-power arriving to campus on Saturday. Campbell Scott will be showing his new mockumentary, Company Retreat, at 7:15 pm on Friday, May 21st, in the Warch Cinema. 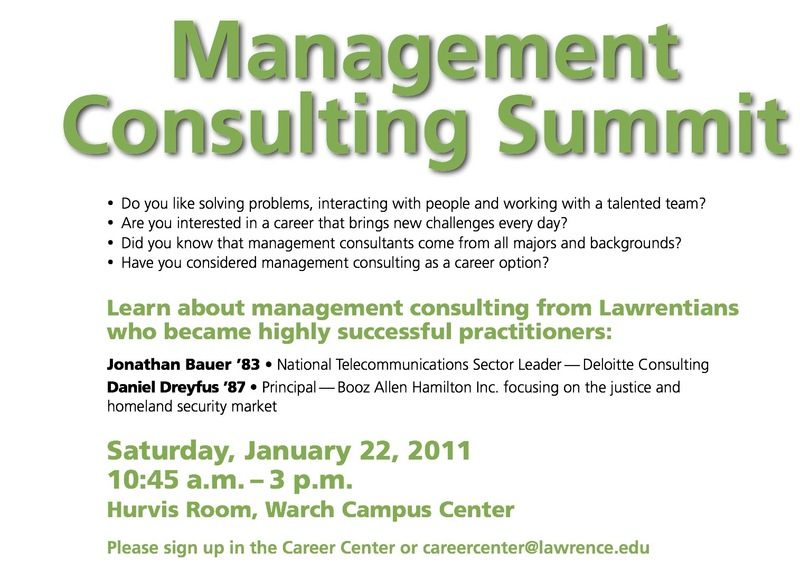 Please sign up in the Career Center, or by email at careercenter@lawrence.edu. There seems to be some difference in the moment-to-moment intensity of an auction theory class and that of an actual auction. Especially when the S&P is amidst an epic tank. As evidence of that proposition, here is the highly-recommended audio from an auction pit in Chicago. Sounds pretty exciting listening to a trillion dollars in wealth evaporate. So exciting, in fact, that I just set the “79s are trading” part as my ring tone. I guess the LSB Chicago trip made it there a day late for this mayhem. I look forward to hearing all about it. Was there blood on the floor? 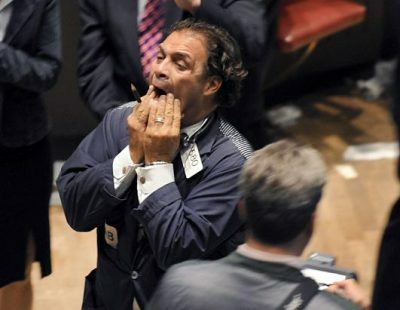 (Picture taken from the Brokers with Hands on Their Faces blog). This week’s This is Lawrence video gives a big shout out to the Lawrence Scholars in Business program, spearheaded by the intrepid, semi-fearless and always venturesome, Professor Adam Galambos. Can you believe all the talent on display? I spotted trustee and LSB champion Bob Perille, LSB-Scholarship winner and I&E reading group member Katelin Richter, Tyler Vane, Suzie Kraemer, Colin Smith, Murtaza, Professors Galambos and Finkler, and many others. Make sure to send it to your parents and friends. And your friends’ parents. And your parents’ friends. It’s simply the best This is Lawrence video in memory. Speaking of LSB, the Chicago trip is coming up. That should be educational and entertaining. Don’t miss it. And, speaking of entertaining, the Entertainment Industry Summit is coming in May. Could LSB rock any harder? LSB Returns in Spectacular Fashion! This weekend the Lawrence Scholars in Business program bis hosting a number of esteemed alums from the investment world. This weekend’s program kicks off at 2 p.m. over in the Warch Campus Center. If you have even an inkling of interest the financial markets coordination of savings and investment, the regulation (or absence thereof) of the financial sector, or even a career in that field, you should think about coming out. (This couldn’t come at a better time for my 240 class, which is learning about the Stigler-Peltzman Capture Theory). The participant information is below and you should sign up in the career center ASAP, or sooner. Copia Capital is a Chicago-area investment firm that manages hedge funds invested in the utilities, industrials, energy and materials sectors. The company is a subsidiary of Morgan Stanley’s hedge fund company, FrontPoint Partners. NorthRoad Capital Management is an employee-owned investment firm in New York City. Saunders manages the firm’s international and global public equity portfolios for both private and institutional clients. Thrivent Asset Management is the securities brokerage and financial advisory subsidiary of Thrivent Financial for Lutherans, which provides financial and insurance products and services to nearly 3 million members. Thrivent Investment Management offers full and discount brokerage services, mutual funds and education funding products. Markus Specks ’06 • hedge fund analyst, Varde Partners, Inc.
Varde Partners, Inc., is a privately-held investment advisor specializing in alternative investments and distressed assets. Headquartered in Minneapolis, the firm also has offices in London and Singapore. The LSB program sponsors an educational trip to Chicago every year. The purpose of the trip is to provide students an “immersion experience” in one of the country’s financial centers. The trip will take place during reading period, on May 6th and 7th. We will leave at 6:00 am on Thursday, May 6th, and return in the evening on Friday. We will have a full schedule, visiting the Chicago Board of Trade, the Federal Reserve Bank, as well as some firms including Madison Dearborn, Copia Capital, the consulting firm Deloitte and Touche, and The Northern Trust Bank. The costs of the trip are covered by the LSB program. 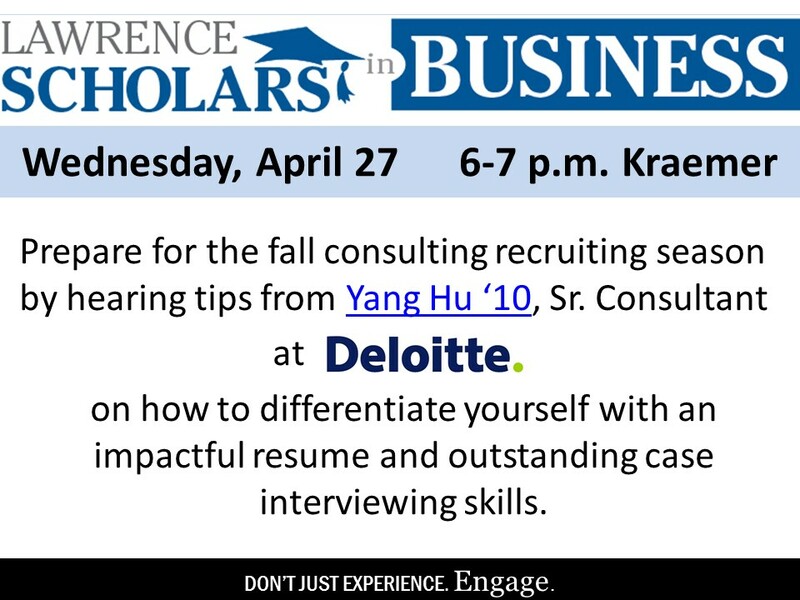 This trip is a great opportunity to learn about the financial world (and a consulting firm) up-close, in a way that you couldn’t do on your own. If you would like to join, sign up by giving Adam Galambos an envelope with $20 in it, and your name on it. We will return the money to you when you board the bus at 5:45 am on May 6th. Should there be more students interested in going than spaces, preference will be given to students who did not go on the trip last year and to juniors and seniors, as they are less likely to have another chance to go. But, if you are interested in the business world, sign up, whoever you are—if you don’t get to go, we’ll return your deposit, of course. The deadline for signing up is April 12th. Email Adam Galambos with questions. In preparation for this weekend’s big LSB Investments Summit, it might be useful to ask the question: Is venture capital a big waste? Well, that might be overstating it a bit, but the potential profitability of venture capital is the topic of James Surowiecki’s new piece in MIT’s Technology Review. He diagnoses the problem of there being too much VC money out there, and the glut is putting a big crimp in the side of an industry that once produced monster profits. On the other hand, shouldn’t we expect that a profitable industry would attract entry, driving (economic) profits to zero? (Hint: yes). Is that a bad thing or a good thing? Those interested in diving deep into this subject should consult Josh Lerner’s new book, Boulevard of Broken Dreams: Why Public Efforts to Boost Entrepreneurship and Venture Capital Have Failed — and What to Do About It. UPDATE: Here’s Lerner interviewed at Vox.